Ever Wonder What Doctors Feed Their Kids? Everyone gets the munchies at some point. For kids, its important and necessary to have regular healthy snacks between meals. Generally, my only snack occurs in the mid to late afternoon, curbing my hunger so I don’t over indulge at dinner. Here’s my rule of thumb: snacks of fresh, raw fruits and vegetables are unlimited. Now here’s why…Produce is packed full of great nutrients, and the fiber in fruits and veggies can fill you up on far fewer calories than other snacks. 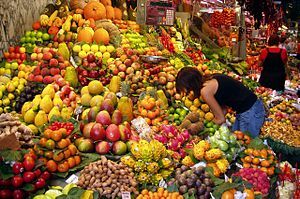 Its virtually impossible to get fat munching on raw produce throughout the day. While total calories matter, the number of calories contained in plain fruits and vegetables is not what will put you over the top on your calorie count. For that reason, I also suggest making produce the centerpiece of each meal. Start by eating the veggies on your plate at lunch or dinner and you’ll fill up more on that, limiting the amount of bread, pasta or meat you ingest. When it comes to snacks for my kids, I follow the same rule. They are allowed unlimited raw fruits and veggies. In our home, my kids tend to gravitate toward bananas, baby carrots, broccoli, apples, berries, pears and kiwi for their snacks. I avoid processed fruits, like applesauce, preferring instead to get the most fiber and nutrients from the actual fruit. I never offer fruit juice to my kids as a snack or with a meal, except on their birthdays. We call fruit juice “baby crack.” Just like soda, it can be addictive. Its not worth the whining from my kids if I have juice in the house, so by keeping it out of our home, I avoid negotiating. For both snacks and meals, my kids drink water or fat free milk. Wondering how to get your kids to request broccoli or carrots for their afternoon snack? My suggestion is that you don’t keep junk food in the house. Your kids are only human. Just like you, if presented with an apple or a bag of chips, what do you think they’ll want? Guide them with a myriad of healthy choices and then let them select what they want. If you didn’t start off feeding your kids this way, they’ll balk, but eventually they’ll realize that these are their choices and they’ll learn to love the healthy options. Letting them make the choice between the fruit and veggie options gives them the control they crave. Thanks for listening and I wish you the best of health! So many people think they are giving their kids something healthy when they give them juice–I used to be one of them. I think everyone’s heart is in the right place, we just need good, accurate info to make the best decisions for ourselves and our kids. Thanks for sharing such useful and helpful info! Truly fresh squeezed or pressed, pure juice, without any sugar or other additives, isn’t the worst thing in the world, but even then you miss out on the fiber found in the whole fruit. Most “juice” sold in stores isn’t worth ingesting. I’d rather see my kids eat an orange. It might be messier, but I know (and like) what I’m getting. Your comment was so true about one’s heart being in the right place. I certainly thought juice was a good thing until I started reading the literature on obesity and started reading labels. Its easy to think you’re making a good choice as long as you aren’t drinking or giving your kids soda. Avoiding juice just takes your parenting prowess up a notch. Let's Talk About Binge Eating Disorder! Enter your email address to follow this blog and receive notifications of new posts by email. Thanks & I wish you the best of health! The content on this site is for informational and educational purposes only. The site is not a substitute for medical advice, diagnosis, or treatment. Terms & Conditions | Disclaimer.